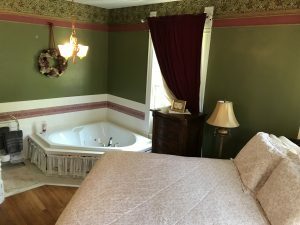 The Nathaniel Hawthorne room is a guest favorite due to the beautiful two-person corner jetted tub in the room, the tall, hand-carved mahogany queen sized bed, and the unique decor giving it a very romantic feel. We used embossed wall paper in a deep sage green, with a bronze colored picture rail, and topped the room with the historic hand printed wallpapers from Bradbury and Bradbury in the Raspberry Bramble design. The ceiling medallion encircles an antique light fixture that is original to when electricity was added to the house. Additional amenities include in room coffee service, flat-screened TV/DVD and wireless internet. 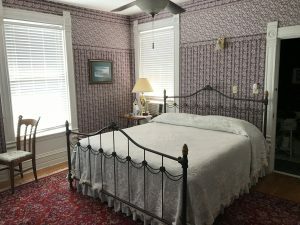 The only room on the first floor, the Laura Ingalls Wilder room features a tall, king sized, four poster bed of hand-carved mahogany with colors of purple and gold featured in the room and rug. It has a larger private bathroom with a single person jetted tub, with a combination rain head shower and marble wall tile. The room also offers a walk in closet with a roll away bed that allows a third person to be accommodated. Additional amenities include in-room coffee service, flat screened TV/DVD, and free wireless internet. 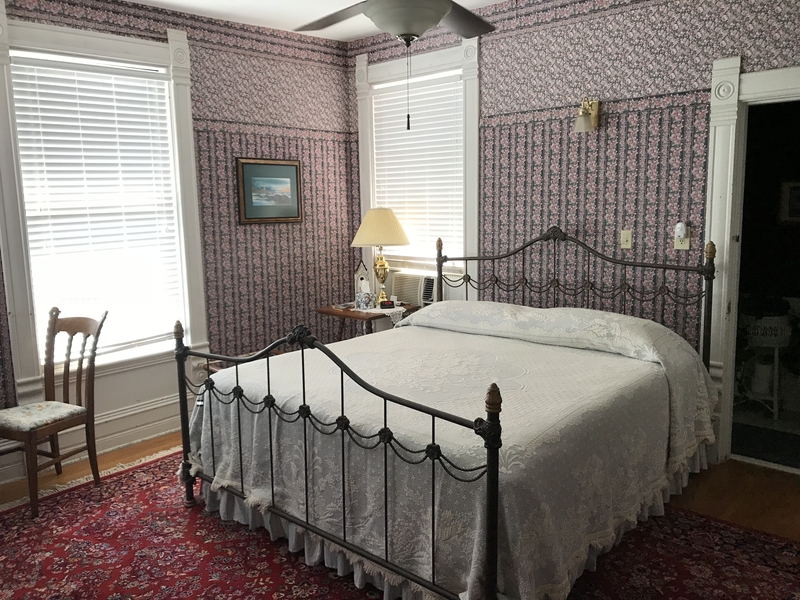 Spacious and elegant room in colors of navy and rose/red, upstairs on the south side of the house, with a king bed and a private bathroom with roomy shower. 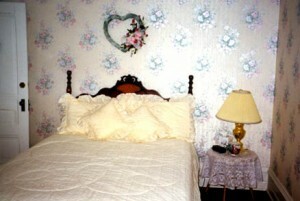 Half of the two-room suite, it can be rented as a single room or as the suite for families or groups up to 5. 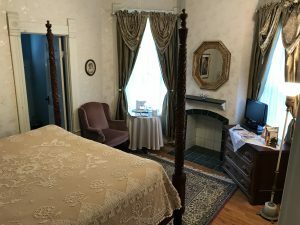 The Twain room also features an antique wardrobe, a converted antique washstand sink, in-room coffee service, flat-screened TV/DVD, and free wireless internet. E. B. White Room – Newly Remodeled! The E.B. White room, named for the beloved author of Charlotte’s Web, is attached to the Mark Twain room and offers options for families and groups. We can open the connecting door between the rooms and it will add a queen and a twin bed along with the king in the Mark Twain room. Bathroom is through the the Twain room, and this room cannot be rented by itself, only as a suite. 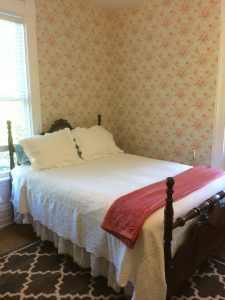 Use the calendar for Mark Twain to see the availability of both rooms together. The Louisa May Alcott room features a newly remodeled and expanded bathroom with a larger shower with both rain head and hand-held shower attachments, and a charming antique English washstand with original floral tile back splash and a vessel sink. Soothing colors in the room are grays and cream, on an antique cherry sleigh bed with matching dresser. 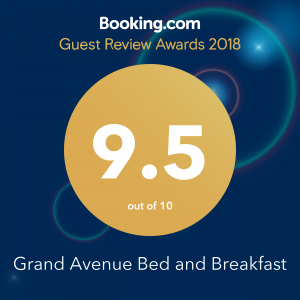 Other amenities include in-room coffee service, flat screen TV/DVD and free wireless internet.